The purpose of this blog is to highlight the presence of the people of the African Diaspora in period costume dramas. It is also to provide a historical context to the films featured. This is the full length trailer for Barry Jenkins' stunning film 'If Beale Street Could Talk'; based on the 1974 novel by American writer James Baldwin. The film follows a pregnant Clementine “Tish” Rivers (Kiki Layne) as she sets out to clear the name of her falselt imprisoned fiance Alonzo “Fonny” Hunt (Stephan James). The film currently has a 92% on Rotten Tomatoes and was named first runner-up for the People's Choice Award at the 2018 Toronto International Film Festival. Its always awesome when people see a black character in a period film/series and send me a link. This exact thing happened this morning when I was meet with a tweet from Evangeline Holland (author of wonderful Edwardian & WWI romantic historical fiction)! Set in 1930s, a black woman with mysterious abilities interviews to be the housekeeper to an eccentric white widow, but in order to get the job she must use her abilities in a way she didn't intend.https://t.co/luu0wAPtyi — Evangeline Holland (@evangelinehbks) April 10, 2018 Thanks Evangeline, You're Awesome! Set in 1930s, a black woman with mysterious abilities interviews to be the housekeeper to an eccentric white widow, but in order to get the job she must use her abilities in a way she didn't intend. Look at all of these beautiful ladies! The costumes are impeccable. If this photo was in black and white would we know what time period it was actually taken in? 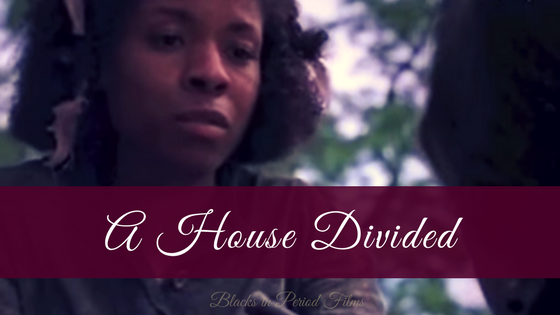 We discussed A House Divided before, here is a full review. A House Divided tells the story of real woman named Amanda America Dickson. Dickson is the pampered and dotted-on daughter of David Dickson a wealthy and respected cotton farmer and Julia Frances Lewis Dickson an enslaved girl. In 1885, Amanda became one of the wealthiest African American women when she inherited her father’s estate at his death. Unhappy with their inheritances, Amanda’s uncle and contests the will. A House Divided is based on the 1995 biography by Kent Anderson Leslie titled Woman of Color, Daughter of Privilege: Amanda America Dickson, 1849-1893.